I attended the show on the 25th and I will say this about the bike show. The show was more organized than the past few shows I have attended. this is a plus in your favor. The one thing you have to work on is the judging. It leaves a lot to be desired. The last few shows the winners have been new bikes and they should be in excellent condition, they are only a couple of years old. There were bikes there in great condition and some of them were more than 10yrs old. It seems like the judges are not interested in bikes that are really taken care, of but only go for the newer bikes. Until this is corrected I will not show my bike in any more of your shows. I really like your fests but this is not fair to bikers that really take care of their bikes and show them at your shows. 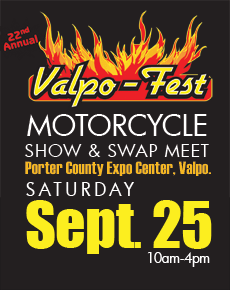 We are really glad you came out and participated in the Show at Valpo-Fest this fall. Judging on Bike shows is a bit of a tricky business, the judges mostly bike builders, magazine editors and publishers etc, as well as our popular vendors choice and crowd choice categories. We love older bikes and actually if you had entered our classes for vintage/ older bikes that is all that is allowed to win in those classes so please keep coming back and next time if you have questions about the class your bike should be in don’t hesitate to ask!